Our premium carrot cake baking mix made exactly as it should be- in a moist bundt cake with a cream cheese glaze, cute toasted coconut cream cheese carrot cupcakes, and a gorgeous layer cake iced with vegan cream cheese frosting. Let’s get baking! Spring has sprung and so has our intense desire for carrot cake. Is that just me or is carrot cake something associated with Easter and the start of spring? As much as I love a soft and moist carrot cake, what really gets me going in for more slices is the CREAM CHEESE FROSTING! I don’t know what it is about cream cheese frosting but it is the kind of thing I could eat off a spoon. And I do. We love carrot cake so much that we have an individual Premium Baking Mix for the job. 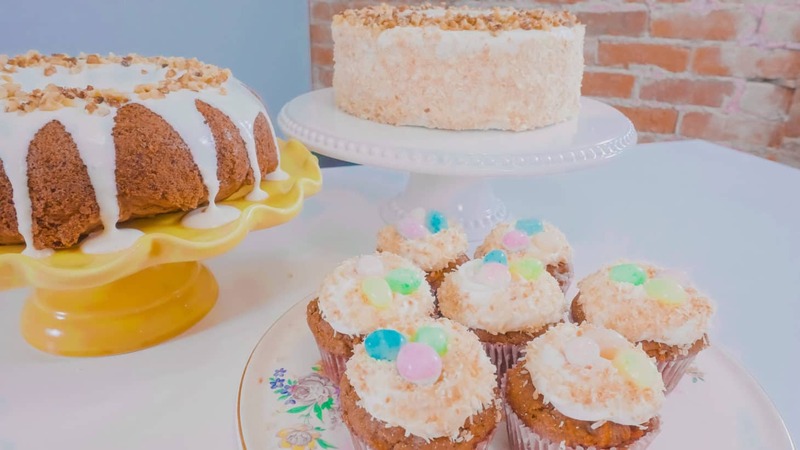 Although this mix can be made with any vegetable or fruit that can be grated (those recipes will come in time), we thought we would go all out for Easter and show you how to make our signature carrot cake, 3 ways. Bundt cake, cupcakes and layer cake. Each cake has its simplicity and challenges, so do what you feel most comfortable with. One baking mix will make one type of cake, so if you decide to make all three you will need three carrot cake mixes. The unique learning piece of this recipe is our coveted cream cheese frosting. I mentioned earlier how much I love cream cheese frosting. So when I founded the bakery I decided that ALL icings would be cream cheese. Our totally dairy free and vegan cream cheese frosting is stable at room temperature, thick and not overly sweet. It really can vary in result depending on which brand of non-dairy cream cheese you use. Tofutti’s original non-dairy spread is the ULTIMATE cream cheese for the job. But I have bad news. Tofutti can no longer sell its beautiful original non-dairy spread in North America. Legislation has made it illegal to sell food that contains any hydrogenated or partially hydrogenated oils in it, and this incredible spread had a trace amount of partially hydrogenated oil in it. Which I get, why do we want to eat those kinds of oils, the health effects are ghastly. But realistically, so are the effects of cow’s milk cream cheese. This is dessert people, frankly you already are eating a treat, so a little bit of the unhealthy fats won’t kill you. Regardless, end rant. The other Tofutti brand cream cheese just don’t compare so frankly I would not use it, unless you can somehow find a way to replace the hydrogenated richness that was in the past oil. I would not recommend Daiya cream cheese for two reasons: a) it is not stable at room temperature in the form of an icing, and b) Otsuka. I guess it’s safe to say were on the market for a new non-dairy cream cheese: any suggestions? Preheat oven to 350°F. Choose your pan: bundt pan, two 8 inch dark cake pans or a standard cupcake pan. For the bundt: grease pan completely with coconut oil and set aside. For the cupcakes: fill each cupcake well with a cupcake liner and set aside. For the layer cake: grease each cake pan well with coconut oil. Cut out a round piece of parchment paper that will fit in the bottom of the pan (doesn’t need to be the perfect size) and place it in each pan. Set aside. Prepare carrot cake mix as directed on package. Add in coconut flakes, raisins, nuts, cranberries or pineapple as desired. Portion batter into each pan as appropriate. For the bundt: completely fill the pan with all batter evenly. For the cupcakes: portion batter into each cupcake liner. For the layer cake: pour half the batter into one cake pan and half into the other. Smooth with a spatula. For the bundt: bake for 35-45 minutes. You will know its done when there are cracks forming on top of the cake and it is firm to the touch. For the cupcakes: bake for 15-20 minutes. For the layer cake: bake for 20-25 minutes. You will know they are done when they are firm to the touch and either a cake tester comes out clean or cracks form on top. Let your cakes cool completely. For the bundt: Run a knife lightly around the sides of the bundt pan. Place a plate or cutting board on top of the pan. Holding onto the edges of the pan and the plate, flip the cake over. The cake will fall out slowly and evenly if you loosened the sides well. For the cupcakes: Let cool in pan and remove like you would with any cupcake. For the layer cake: Run a knife gently around the edges of the cake in the pan. Let cool completely in pan. Once cool, place a plate or cutting board on top of the pan. Holding onto the edges of the pan and the plate, flip the cake over. The cake will fall out slowly and evenly if you loosened the sides well. FREEZE YOUR CAKES FULLY BEFORE USE. Prepare the icing. Cream room temperature non-dairy butter and cream cheese in an electric mixer for 2 minutes on medium high speeds. Once creamed, turn the speed down to low and add icing sugar in the mix, half a cup at a time (unless you like wearing icing sugar, then by all means, go for the whole 5 cups in one go). Once incorporated, add in another half cup. Once all icing is incorporate beat the icing on medium speed for another minute. You’ll know the icing is perfect when you can pull the beater out and the icing stays peaked and firm (essentially the icing doesn’t melt back into the rest of the icing if pulled out). For the bundt: take half of the icing and add 2-4 tbsp of non-dairy milk into the mix. Stir well until the icing is the consistency of cake batter. Pour icing slowly and evenly on top of the bundt cake. Decorate with chopped nuts, toasted coconut or Easter jelly beans! For the cupcakes: portion half of the icing into a piping bag or ziplock bag outfitted with any piping tip (if you don’t have a piping tip, just cut a half inch hole in the end of the bag for the icing to flow from). Starting in the middle of the cupcake with your piping bag at 90 degrees to the cupcake, squeeze your piping bag from the top while pushing down and swirl your icing into a 2 layer pile. You want this to be flat on the top so end your piping stream once the second round of icing has been piped by stopping the flow and pulling the bag away. 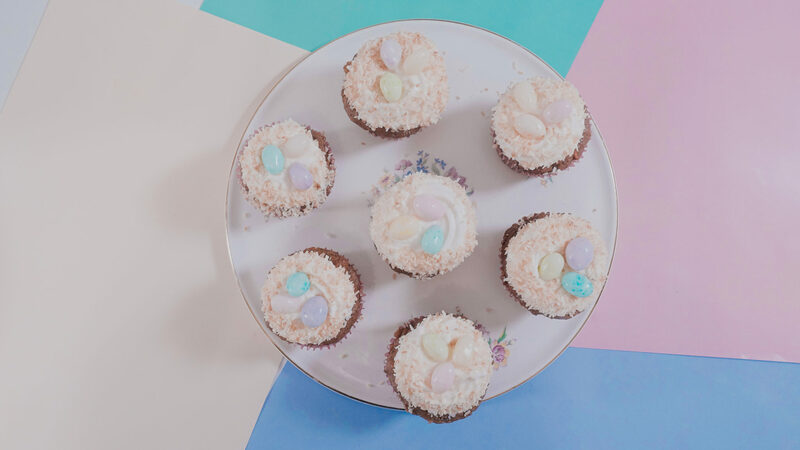 Press toasted coconut into the sides of the icing using your hands and decorate the top with Easter jelly beans or chocolate. Using a sharp knife, cut the edges of your cake off. Be very systematic with this to not take off too much cake on one side. This is just to remove the caramelization of the cake edges. If your cake has a dome shape on the top rather than being flat, use your sharp knife to cut the top of the dome off in a STRAIGHT and EVEN line. This is challenging, but your cake might become lopsided if you do not do this. You want to stack your cakes on a flat surface. Spread a tablespoon of icing on an 8 inch cake board or plate (a plate will be more challenging to decorate, but its your choice). Place your first layer of cake on top of the board. Portion half of the icing into a piping bag or Ziploc bag with a half inch tip cut off the end. Pipe around the entire top of the cake layer starting from the centre and moving outwards in a spiral. Using an offset spatula, or a knife, evenly spread and flatten the icing to the best of your abilities. If you have a cake spinner, spin your cake around as you do this to help ensure the layer is even. If some icing comes off the side, don’t worry about it, just leave it for now. Place the second layer of cake on top of the icing. Repeat the same step of icing this layer using the piping bag and evening it out with a knife or offset spatula. Pipe more icing around the sides of the cake. You can go around the cake 1-2 times, we aren’t trying to cover the cake right now. Spread the icing using the knife or offset spatula evenly, but it doesn’t need to be perfect. We are making the crumb coat. Place the entire cake in the freeze for a half hour to chill the crumb coat. Once the crumb coat has chilled, pipe the remaining icing all around the cake, it does not need to be totally even or perfect. You are going to use the offset spatula or knife again to smooth out the rest of the icing. If you have a cake spinner, again this will help ensure you have a nice even finish. A cake scraper is also a handy tool to use to even off the edges of the cake, giving it a nice, professional finish. Decorate the cake: using your hands, press toasted coconut into the edges of the cake. Top with chopped nuts, jelly beans or chocolate. Store your cakes or cupcakes at room temperature for 24 hours. Freeze for up to 4 weeks and do not refrigerate unless you want dry cake! 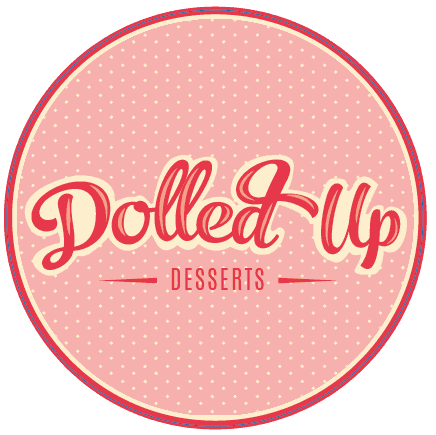 © 2018 Dolled Up Desserts®. All rights reserved.